Dark Avengers is an odd comic book. It is a popular book because it deals with story lines and characters which have an impact on current events in the Marvel Universe. Yet the amount of actual story per book seems very limited at times. I swear it is often the shortest book I read. There was one issue when Norman goes on television for an interview where there is a lot of dialog, but besides that... Many issues are filled with looks of wonder, enjoyment, or horror. Dark Avengers #15 is no different than most of the Dark Avengers books of late. There are whole pages of just reactions or movements. I feel like Dark Avengers drags stories out too long and would better be suited as a trade paper back purchase. The actually characters such as Bullseye, the newer Venom, Daken and Norman Osborn are fun to follow along with, as well. They are at times so evil we root for them to get away with their debauchery just so that when they get caught or overrun by their good guy counterparts, it will be much sweeter to watch them fall. In Dark Avengers #15 we pick back up on the Dark Sentry line which has been filling the book lately. We are watching the fall of the Sentry and the rise of his dark side, the Void. Dark Avengers #15 acts as a flashback which catches Siege readers up on what was happening behind the scenes leading up to what is currently happening in Siege. Dark Avengers has become a book showing you the intricacies of moments missed while the main Marvel story was unfolding. 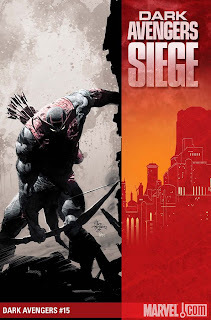 As The Mighty Avengers comic books were to Secret Invasion (showing you what was really happening with the Skrull infiltrators), so is Dark Avengers to Siege. Why is Sentry so lost and out of control? I think Dark Avengers #15 gives you an idea why. Overall this comic of the day, Dark Avengers #15, is just okay. It reads super quick and gives a bit of insight into what is up with the Sentry, but to be honest there aren't a lot of Sentry fans out there right now. I'd say it's a good thing Dark Avengers is coming to end soon before the issues stop getting just accepted as okay and start getting completely hated.